The USS Washington during seal trials in April 2017. 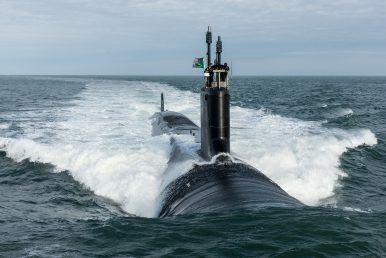 The U.S. Navy has christened its latest Virginia-class nuclear attack submarine, the future USS South Dakota, during a ceremony at General Dynamics Electric Boat Shipyard in Groton, Connecticut, the service reports. The South Dakota is the 17th Virginia-class attack submarine and the seventh Virginia-class Block III submarine. According to Kris Osborn over at Scout Warrior, the South Dakota is the most technologically advanced nuclear attack submarine ever developed by the U.S. Navy. It reportedly features a host of technological innovations including quieting technology for the engine room, quieting coating materials for the sub’s hull, and a new large vertical array. The new sub has been a “technology demonstrator to prove out advanced technologies,” Naval Sea Systems Command Spokeswoman Colleen O’Rourke told Scout Warrior. “Lessons learned from South Dakota will be incorporated into Block V and later Virginia Class submarines, increasing our undersea domain advantage and ensuring our dominance through the mid-century and beyond,” O’Rourke added. While the first 10 Block I and Block II Virginia-class submarines feature 12 individual 21-inch diameter vertical launch tubes able to fire Tomahawk Land Attack Missiles (TLAMS), “the Block III submarines are built with two-larger 87-inch diameter tubes able to house six TLAMS each,” according to the U.S. Navy website. The new 87-inch tubes have been designed to accommodate future missile systems in addition to the Tomahawk. In addition, Virginia-class Block III boats are equipped with four torpedo tubes for MK48 torpedoes. Furthermore, next to a redesigned bow, Block III Virginia-class boats also contain “a water-backed Large Aperture Bow (LAB) sonar array that replaces the air-backed sonar sphere found in the first 10 Virginias.” This, in combination with the its so-called fly-by-wire capability, enables the boat to perform important intelligence and surveillance missions. The U.S. Navy commissioned the Virginia-class nuclear attack submarine USS Washington (SSN-787), the 14th sub of the Virginia-class sub this month. In September, the U.S. Navy accepted delivery of the 15th Virginia-class sub, the USS Colorado (SSN-788). The U.S. Navy plans to commission a total of 51 Virginia-class attack submarines in total.